Wood vs. Metal: Which Is Best for Your Horse Barn? Ask a group of horse owners which they prefer for their horse barns and sheds and you’re likely to find strong opinions on both sides. Often cost is a big factor in choosing materials for a new pole barn structure, but in many cases the costs of materials and labor for wood or metal come out pretty even, leaving the indecisive farm owner stuck on the fence. The following are some of the main considerations horse owners have to weigh when choosing between metal and wood. We’ll let you decide which scores higher in your book when it’s all said and done. Some people love the sound of rain thrumming on a metal barn; others find it distracting. On this one, we’re going to have to give the point to wood. Wood provides a quieter interior all around, which is a selling point for many people. While both steel and wood barns can be insulated, taken by themselves, wood barns and roofs provide greater insulation than metal. Wood will keep your barn a little cooler in the summer and warmer in the winter. Wood also breathes, which can help vent some of the humidity that naturally accumulates in a barn. For insulating properties, once again, we’re going to give a point to wood. So far, 2-zip. While some wood exteriors are made to weather without paint, the majority require periodic painting or staining to prevent rot and maintain their beauty. To some, this is a major point in metal’s favor. Metal buildings have been known to last 30 years and more without repainting. In addition, wood is prone to rot, animal and insect damage, and some horses can’t take their teeth off it. For ease of maintenance and weather resistance, metal is the clear winner. 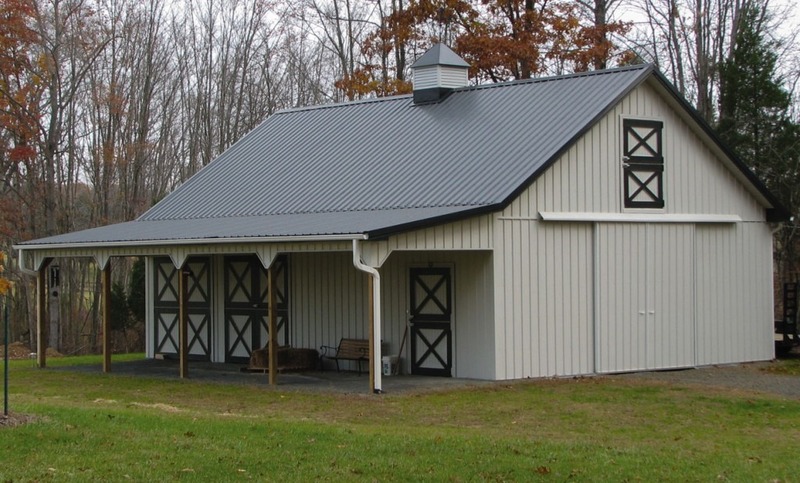 For many who choose a metal barn, durability is another major advantage. Steel is naturally strong and can withstand years of weather extremes without damage, although it is vulnerable to denting when pelted by hail or kicked by an active horse. For this one, we’ll give the point to metal, but it’s a close call. Looks like we’re tied. This barn features a metal roof and siding. Any exposed metal can injure a horse if the horse kicks it or becomes entangled in it. While installing kick boards on interior walls can protect horses in the areas where kicks are most common, horses can suffer serious lacerations anytime exposed metal is present. For safety, the point has to go to wood. Some people prefer the look of a wood sided barn, while others prefer the clean look of metal. Since beauty is in the eye of the beholder, we can’t award a point to either side for aesthetics. Both wood and metal can be used to create beautiful, durable barns. Point for point, wood edged out metal in our survey, but since each person will weigh these factors differently, it’s really a toss-up. We’ve built countless pole barns from metal and wood, and both provide beautiful, durable structures for your horses and your farm. 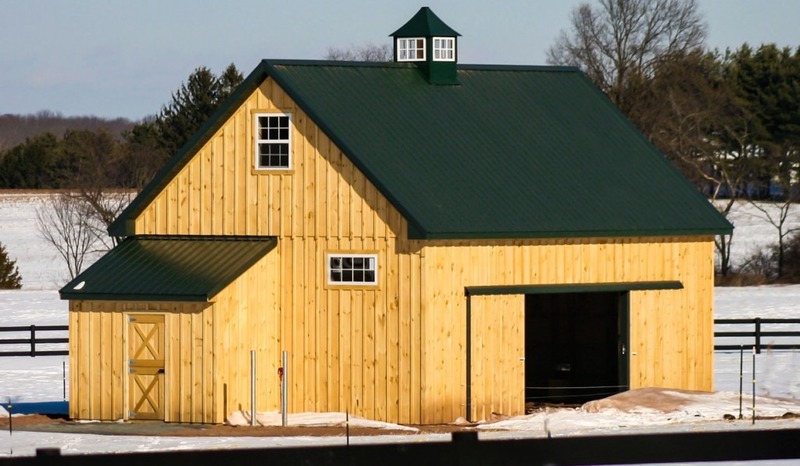 Whether to go with metal or wood for your roof and siding is just one of many choices you’ll have when building a new horse barn with Conestoga Builders. We offer a range of materials, features and designs to create just about any sort of barn you can imagine, and we’ll help you sort through the options to find the best solution for your horses and your farm. Contact us today for a free estimate, or browse our equine gallery to get ideas. You can also use our online designer to create your perfect barn, colors and all. Why not give it a try?